As such, like the very best comedies, Olnek’s are tinged with pain. And while all the shorts feature queerness, the action or conflicts in the films are only indirectly related to gay life or identity. 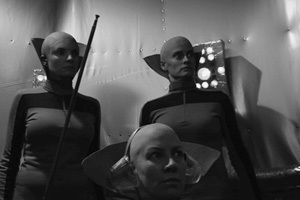 This has recently changed with the release of her first feature, Codependent Lesbian Space Alien Seeks Same, a black-and-white sci-fi retro-New York micro-budget completely absurdist independent comedy, which also manages to thoughtfully address the pain and confusion of sexual prejudice. Now Olnek has proven that she can make an important film without having to make a dramatic one.